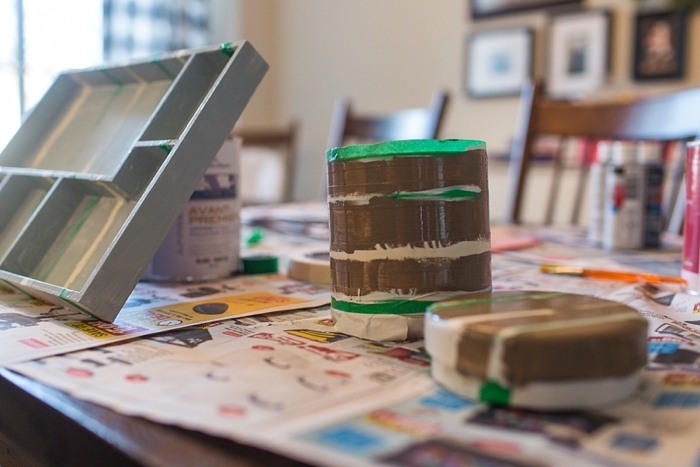 Think twice before you throw things into the garbage or recycling – it’s amazing what a little paint can do! I sometimes have a hard time throwing things away if it seems like they might come in useful again one day. I’m not a hoarder by any means, but I do sometimes end up with cupboards full of “junk” and at some point I either have to finally do something with it or move it along to the trash. After cleaning out my office over the holidays, I came across these two items which had been buried sitting on my desk for a few months. So it was now or never. 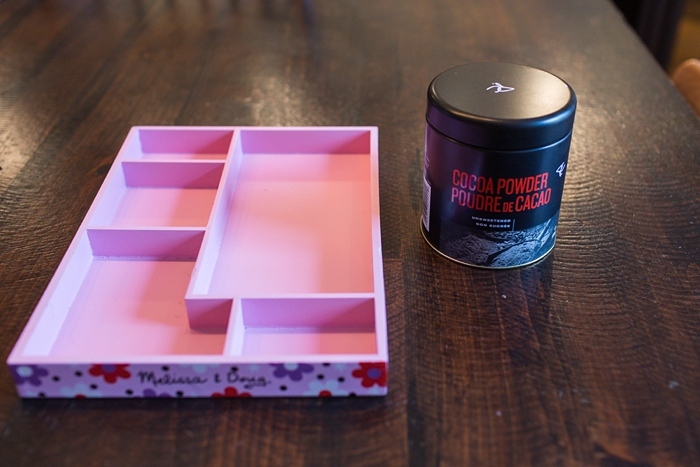 The wooden box that once housed a toy set for Robin and a sturdy tin that once stored cocoa powder. I decided to use spray paint for the tin which I knew would have a glossy finish and I guessed would probably stick better than primer. I used Benjamine Moore primer for the wooden box. Both I already had in the house from previous projects. Each required two coats of primer with an hour or so of drying time in between. 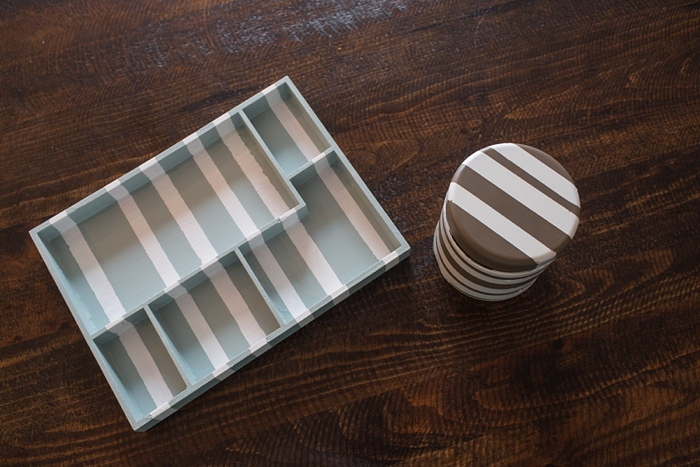 Next, I used masking tape and washi tape to create stripes. I just went with a random pattern. Ta da! The paint did bleed slightly on the wooden box (I think painters tape would work better than masking tape if you want perfect stripes). But I don’t mind the bleeding – up close, it actually looks intentional and kind of cool. Now what to do with these new knick knacks!?! ← Gay Paris | Vacation inspired art! Love the reuse of the magnetic doll box. Just got these for a road trip, and I can’t bring myself to throwing them out!! Love it!